An email received by the Secretary this morning reveals that DOC “have cut up hundreds of metres of serviceable board walk”. A committee member suggested we would need to view the track changes (which we haven’t yet) ourselves before pursuing the matter. 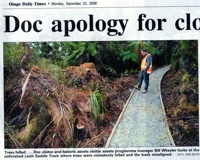 “Native cedar trees in a ‘regionally distinct’ cloud forest remnant have been mistakenly felled by the Department of Conservation during a major upgrade of the Leith Saddle Track, forcing an apology from Otago conservator Jeff Connell.”- See ODT 22/12/2008. page 5 for a full report. So good on our emailer, Lindsay Graham for drawing attention to the cedar felling.